Halloween is on it’s way, so you should be thinking about what makeup you are going to wear. If you haven’t decided already then this is the blog post for you. 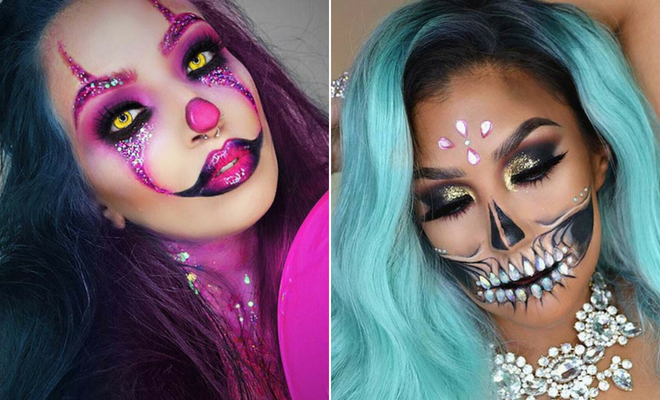 We have rounded up 21 of the most unique Halloween makeup ideas from Instagram. So, you don’t have to spend hours searching – all the coolest looks are here! We have something for everyone including leopards, broken dolls, zombies and more. First up we have this glitter circus clown makeup idea. 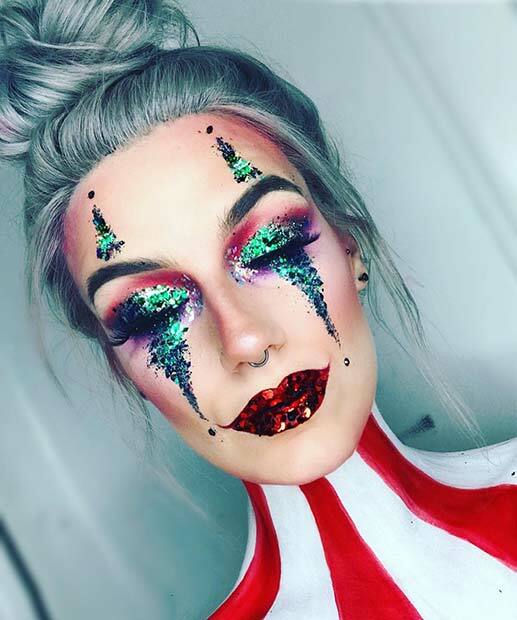 The artist has used the classic clown design with the eyes and lips but glammed it up with green glitter and red sequins. She has also created an awesome stripe design in body paint. Makeup like this would look amazing at a party. You can change the glitter colors to for your own design and swap the sequins for red lipstick. Next, we have a colorful skeleton idea. The face has a half skeleton look and the design continues onto the upper body. Behind the bones is a background of vibrant colors. This is a fun and spooky idea that allows you to wear a Halloween costume without being too scary. Either recreate a similar look or just try the face design if you don’t want to paint your body. 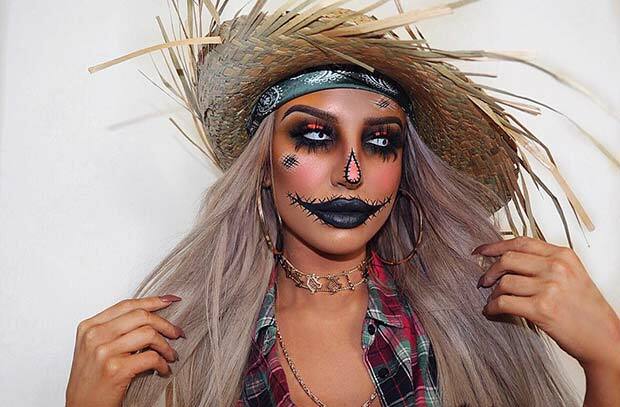 We couldn’t create a Halloween makeup ideas list without mentioning the classic scarecrow. Scarecrows have been terrifying people for many years and will continue to do so. With that said, here is an awesome example of scarecrow makeup. It has all the classic features and spooky contacts. This would be quite simple to recreate at home. Let our your wild side this Halloween with leopard makeup like this! The design features glittering gold spots with super glam makeup. 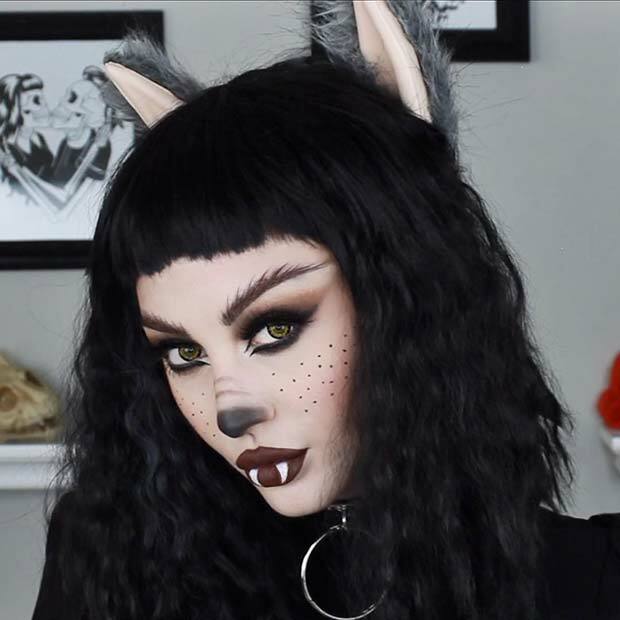 Makeup like this is perfect for when you want to wear something for Halloween but want to look gorgeous too. You can check out the tutorial on the artist’s page to find out how to create the leopard look yourself. 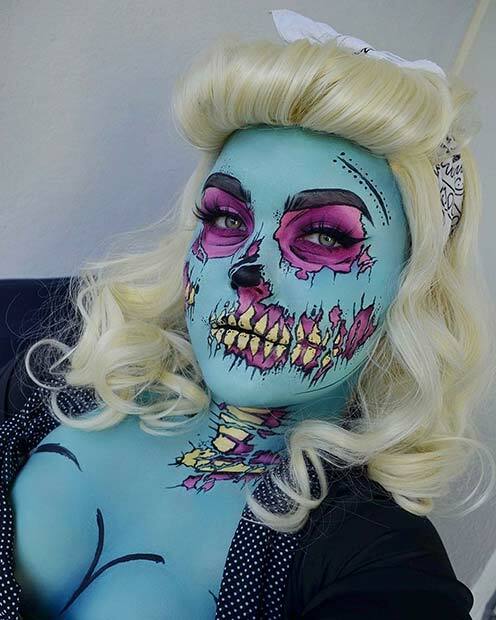 Pop art inspired makeup is very popular at Halloween. Makeup like this usually involves bright colors and designs that look cartoonish or comic book like. Here is a brilliant example of using pop art to create a zombie look. She has used striking blue and purple with a skeletal look. The artist has added a vintage pin-up twist but you can stick to gory zombie if that is what your prefer. If you want to recreate this look for Halloween, we recommend you follow the steps from the YouTube tutorial below. Our next idea features a cracked doll face which is a Halloween favorite. We love this one because the eye makeup is amazing as well as the cracked feature. There are tutorials online to help you recreate the broken look. You can also check out the products used on the artist’s page. Try a similar look to this one or use the cracks on your own makeup design. Next, we have another clown idea. This one is quite unique when compared to the many other designs because it is bright pink. 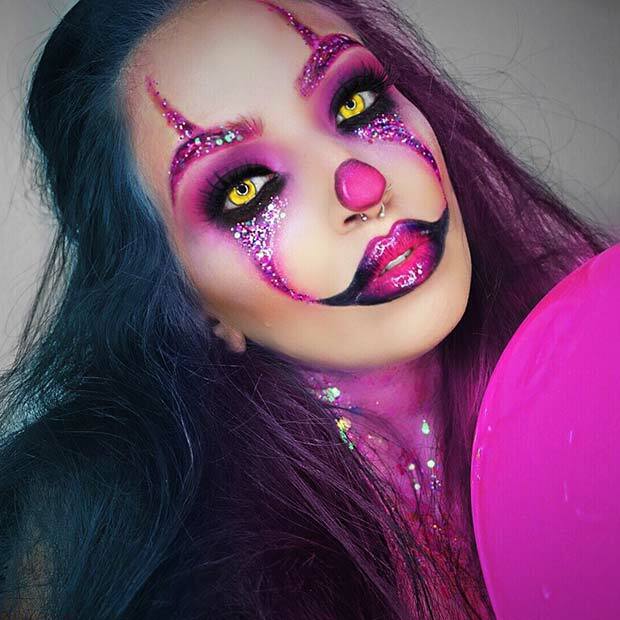 We love this vibrant clown makeup because it is fun but scary. You can recreate the pink look or use a different bold color. Keep your contacts striking though to keep your makeup looking spooky. 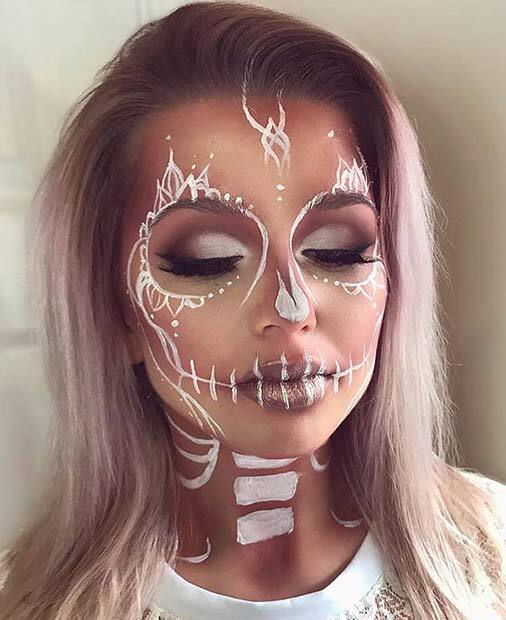 Half and half makeup designs are so popular at Halloween because you get two looks in one. This one features a pumpkin design with a normal face. We love this one because it actually looks like the skin is peeling off. 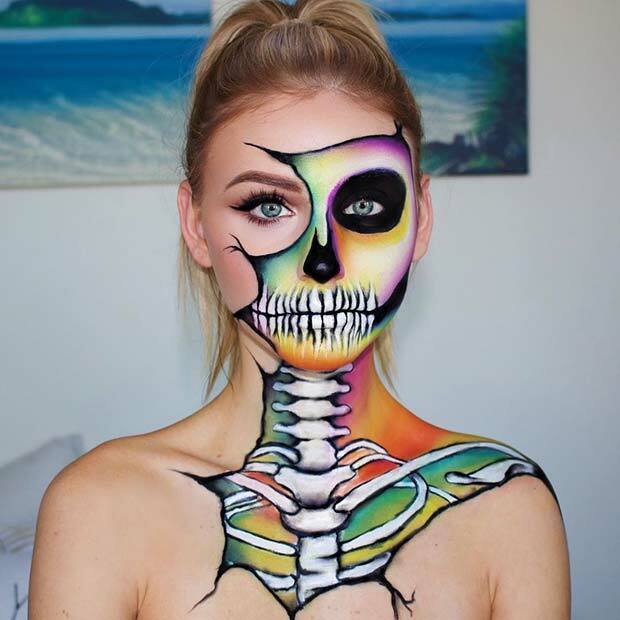 You can recreate something similar to this, use different Halloween makeup or even wear darker makeup on the normal side of your face. Here is a YouTube tutorial for the look! Want to join in with the Halloween fun but want to look pretty too? Then this makeup idea is for you. Here we have a skull design that uses white makeup instead of the classic black and dark grey. By using white you get a more delicate line which gives it an almost elegant look. 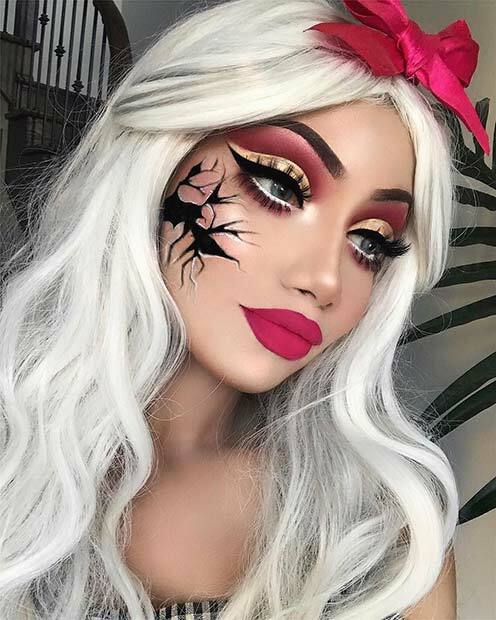 Recreate similar makeup to this or create your own design. Our next idea features another Halloween classic. Here we have a werewolf design. 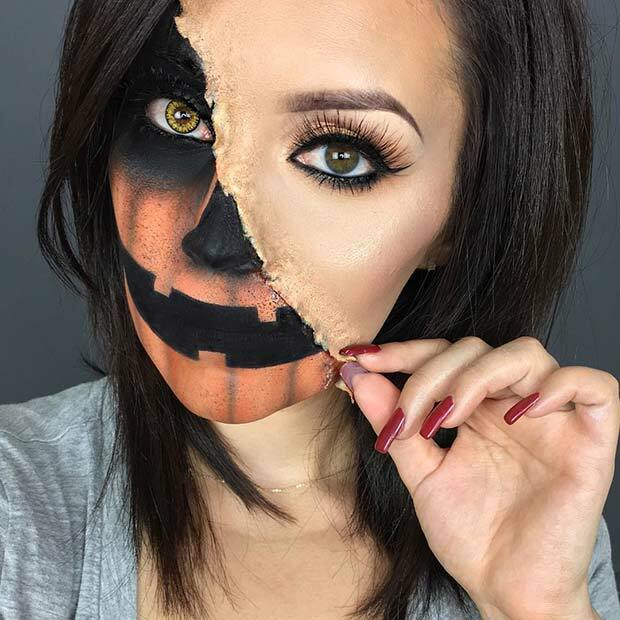 We love this look because it is scary but cute. It would also be quite simple to recreate at home. You can use this as inspiration for your own wolf look or you can use elements of this to create a feline design too. Sugar skulls are not a Halloween costume!it’s cultural appropriation!